Hello! I’m Kristen, a member of the LearnDoBecome team. 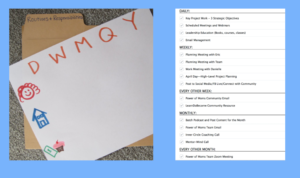 I’m excited to share with you some great tips and apps I’ve compiled from our community and team members to help you move forward on your projects and tasks! 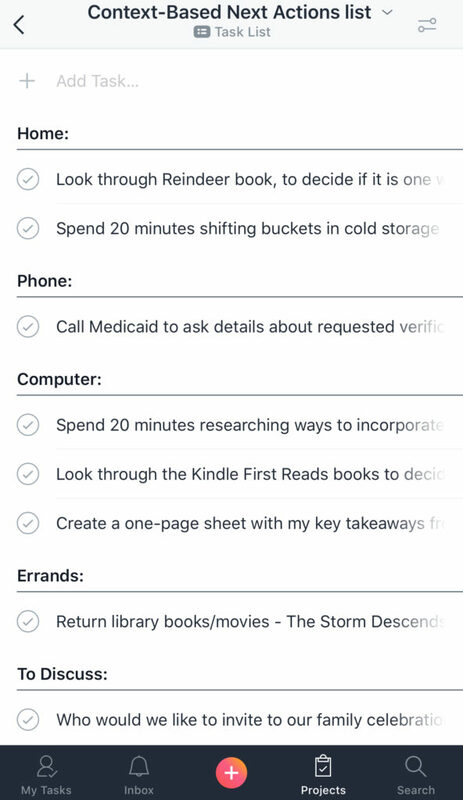 One of the keys to moving forward on projects and tasks is using a Context-Based Next Actions list – a list of tasks, sorted by context, that need to be taken care of during the week, but aren’t time specific. 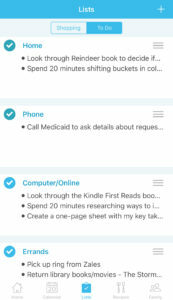 Many of our Steps to Everyday Productivity (STEP) community members have found success in using a digital Context-Based Next Actions list. 1. Add as FEW deadlines as possible. 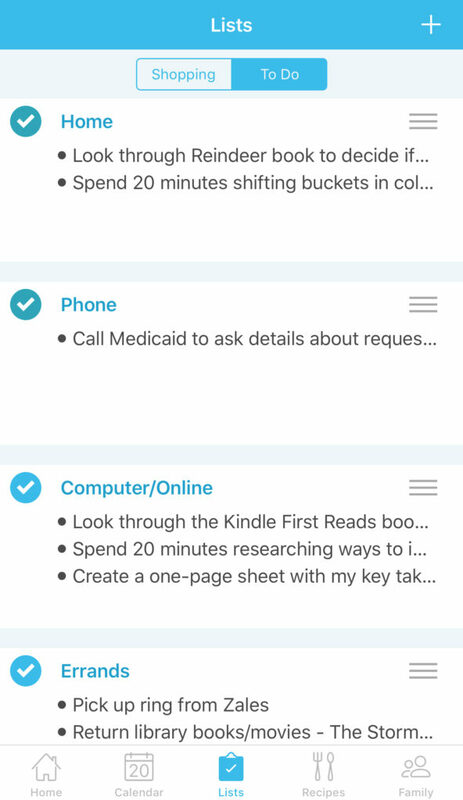 If at first glance your app is full of overdue tasks, it will feel immediately overwhelming. And critical deadlines may be missed, because they got lost in a long list of tasks “due.” Instead, aim to put deadlines where you absolutely must – so you will actually see the deadlines as they approach. 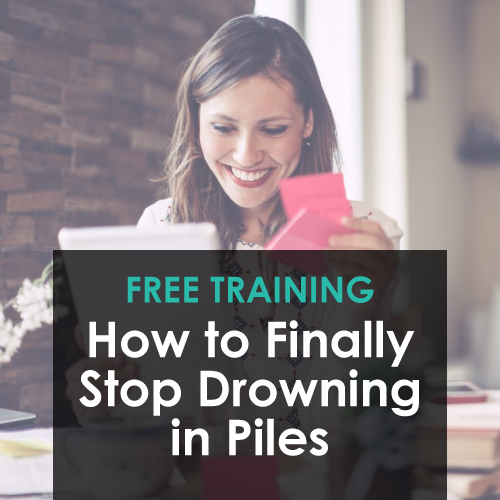 One of the biggest feelings we strive to combat in our STEP program is the feeling of overwhelm. When you feel overwhelmed, getting even the simplest of tasks done can feel impossible and take much longer. And too often our lists are a jumble of projects, tasks, routines, due dates, “someday” ideas, and more. But with a clear mind and a streamlined list, you can make real headway in your projects. 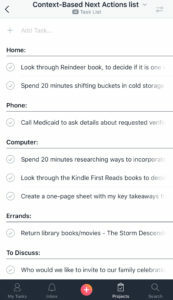 One culprit in a cluttered list is “the two-minute task.” Any task that you can take care of in less than two minutes shouldn’t even be added to your list, because it will take more time to manage that task than it would to just do it. So when a two-minute task comes to mind – just do it! Another way to keep your list streamlined is to only put next actions that you plan to complete this week. If you have more tasks than you know you can possibly complete, place them on a “next-in-line” or “someday” list. This list will keep those ideas safe and off your mind until you are ready to tackle them. Routines are another big culprit to cluttering up lists (and calendars). It is essential to keep your routines totally separate from next actions and projects. And note the difference between a date/time specific routine (like a weekly staff meeting) and a flexible routine (like washing the car). Flexible routines should be kept off the calendar unless you keep forgetting to do them. If you’d like to learn more about routines, we have an exclusive new resource that we’d love to share with you – “Run Solid Routines on Autopilot.” Click here to learn more about how you can participate! 3. 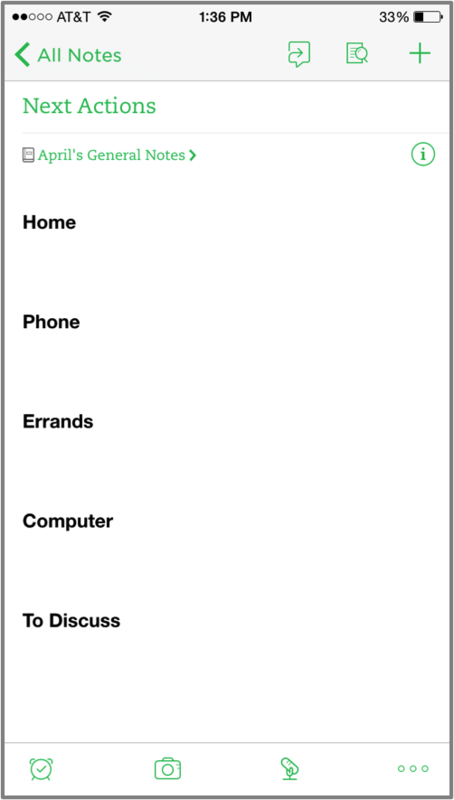 Reference WHERE digital or physical support files are as you are outlining next actions. Some apps have the capability of uploading files or photos directly (like Asana), and most apps have the ability to add a link to a website. Some apps can even link to another app (like OmniFocus’ Mac app). Other times, you’ll want to simply reference where the resource is. Fill out the County Property Tax filing form (in Finances cubby). Create key takeaways summary from the Family Systems workshop (notes in Evernote: Conference Notes). Also, including the phone number (for a business or person you need to call) can make it that much easier get started, when you’re ready to make phone calls. Click to learn more about Evernote! Used by April and Eric, this app can be really easy to set up because it is so versatile. 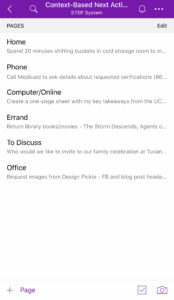 We’ve seen set ups within Evernote that include a Context-Based Next Actions list, Current Projects list, “Next in Line” or Someday Projects list, Routines & Responsibilities – and more! If you are looking to keep things simple and stick to using one app for most of your digital system, Evernote is a great choice! Click to learn more about OneNote! OneNote includes much of the functionality you will find in Evernote, but integrates well with the Microsoft Office system. If you use and love Microsoft’s products, check out OneNote. Click to learn more about Cozi! 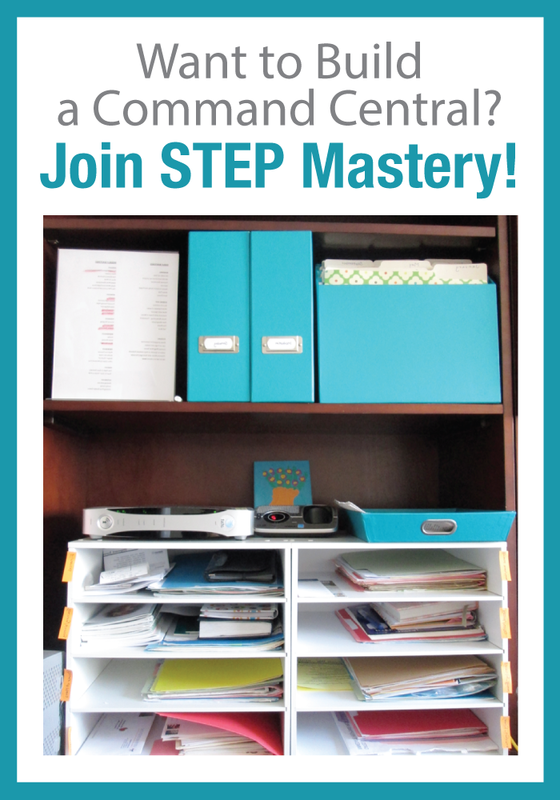 Advertised as being the “must-have” organizer for families, many of our community members love Cozi. 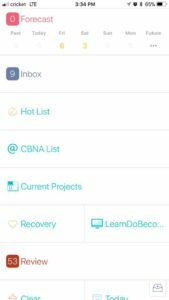 This app can function as your all-in-one place to gather calendars, lists, meal plans, and more. Click to learn more about Asana! 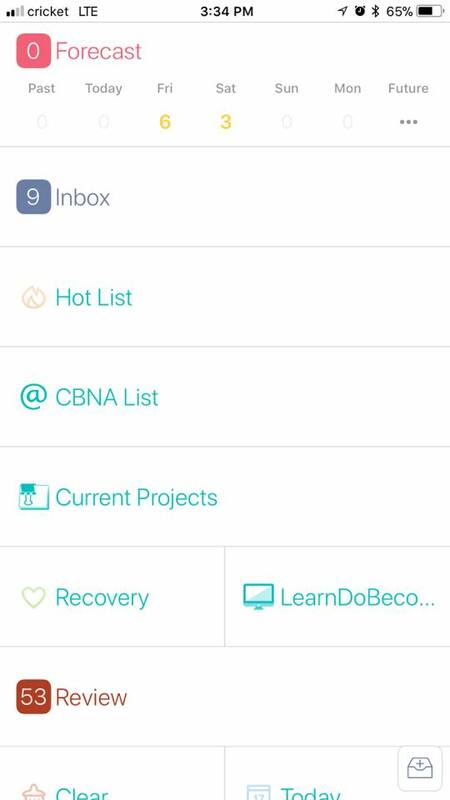 Asana is a great choice for a Context-Based Next Action list, because it has the capability of setting it up as a traditional list or as a board. If you like the visual appeal of a Kanban system, moving tasks from columns from left to right as you work to complete them, setting up boards would work great here! Another feature that can be helpful is the ability to tag a task with more than one project. If you want to look more deeply into Asana, check out this podcast April recorded on how she uses it to manage projects and routines! Click to learn more about Google Keep! Because so many people use the Google ecosystem (Gmail, Google Calendars, etc), Google Keep may be a great option to consider. 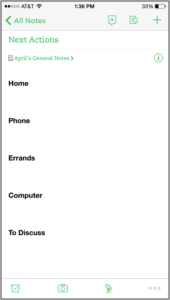 It is visually appealing, with notes that remind me of post-it notes pinned to a bulletin board. And a lot of the features you may already know and love from Gmail (archiving, labeling) are built in. Click to learn more about Trello! 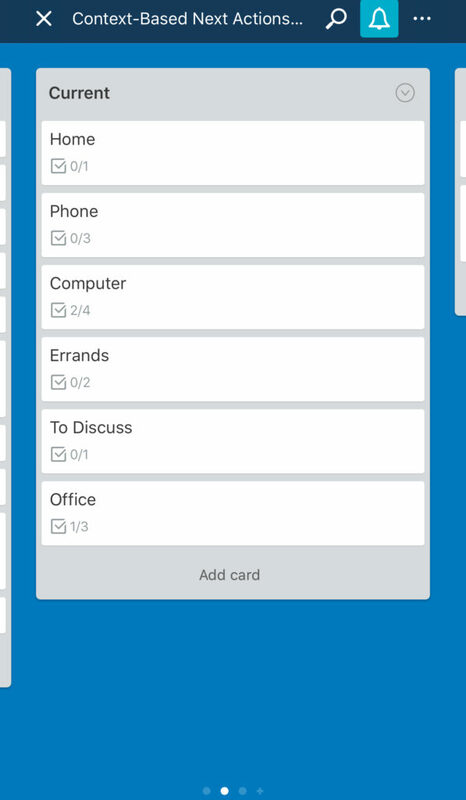 Trello also uses the boards you will find in Asana and other Kanban systems. The ability to upload files, pictures, and attach links is also similar to Asana. 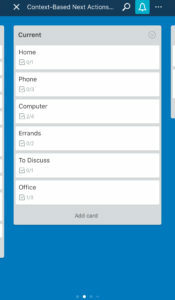 But if you like the visual workflow of using boards and Asana just doesn’t seem like the right fit for you, try Trello! Click to learn more about Reminders! 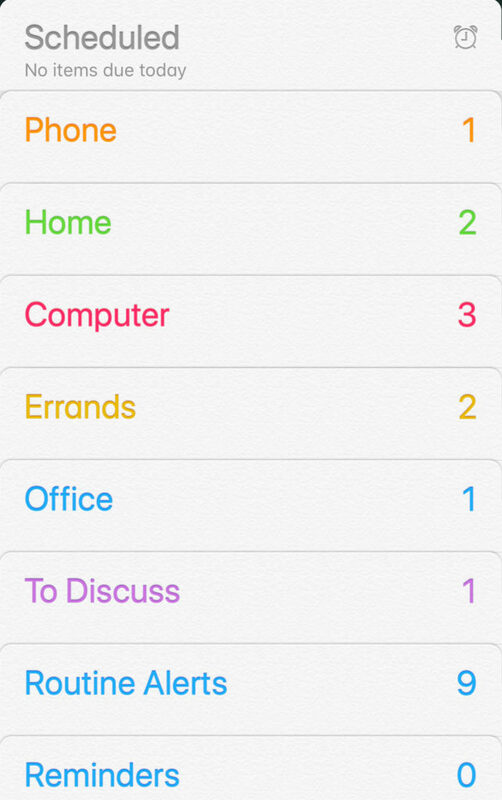 If you gravitate towards Apple devices, Reminders is a great option to consider. 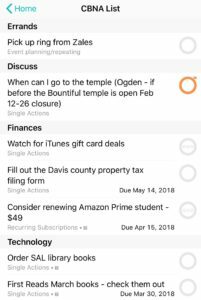 Built into iOS and MacOS, Reminders has a level of integration that you aren’t likely to find with other apps. The process of sharing ideas to your list from Safari and other apps is seamless. 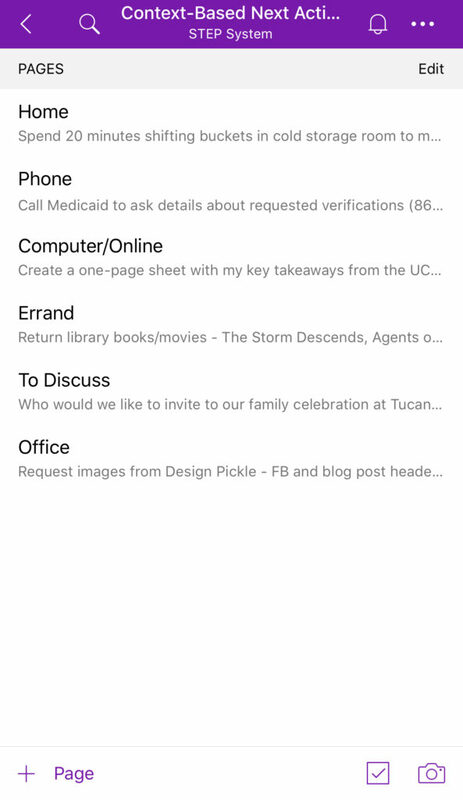 You can even ask Siri to add ideas to your lists – and if it’s a phone call, Siri can add the phone number directly to your next action, making it that much easier to get it done! Click to learn more about OmniFocus! 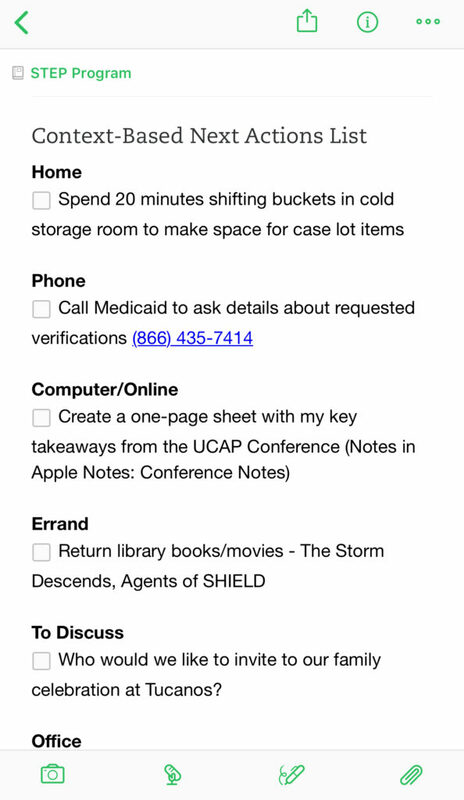 My personal app of choice, OmniFocus was built with GTD systems like STEP in mind. I love the ability to view my projects and tasks in so many customized ways, using the Perspectives feature. 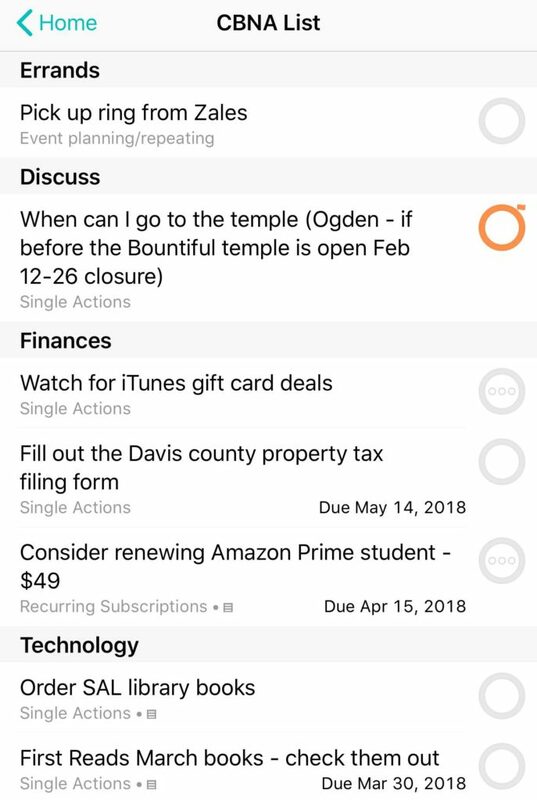 OmniFocus makes it easy to keep my current projects and next actions within one app, outlined in as much detail as I like, without having to micromanage my Context-Based Next Actions list. 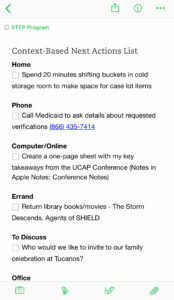 If you want an app with a lot of capability to use on your Apple devices, OmniFocus is a great place to look. 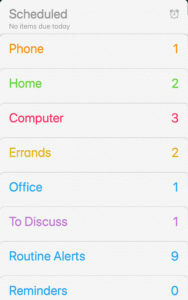 What app do you use to keep track of your next actions? Let us know in the comments below – we would love to hear what’s working for you! Do you have a friend or family member who’s been asking about digital apps? Click here to go to our Facebook post and share with your friends and family! Want to check out any of the apps in more detail? Click on any of the links below to go to their websites! We would love to teach you more about how to use a Context-Based Next Actions list. Come join us in our free class! Or if you’d like to learn more about “How to Run Solid Routines on Autopilot,” click here to learn how to participate! Thank you for sharing your knowledge with me! So helpful! We use Tick Tick and have a shared account. 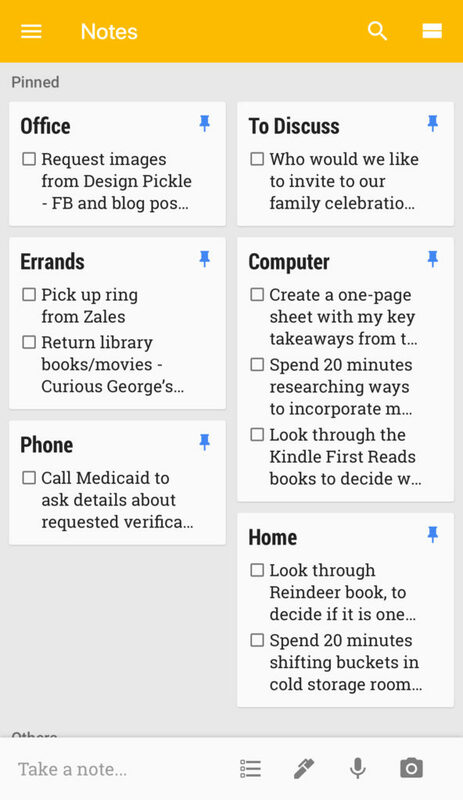 For now it has kept next actions categorized, but our to do lists have become so long due to family circumstances it can get a little overwhelming. We also use Google calendar but as one of us forgets to check it hasn’t helped us get on the same page yet. We use any.do. 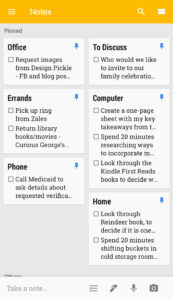 It’s a beautiful to do list that integrates with Google Calendar. You can plan your day with any.do moment, which brings up all your tasks and has you pick the ones that are relevant for today. You can set reminders to go off when you’re in a specific location, like your grocery list could pop up when you arrive at Trader Joe’s.